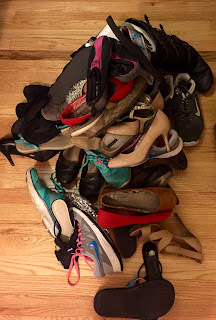 One night after work last week I began to get super fed up with our mess of a closet! I always was great at managing the closet when only my stuff was inside but now with Tim's clothes in there too it's a little more difficult! I had bought quite a few things at the outlets in Florida so I wanted to go through my closet and see if there was anything I could donate. I found that there were actually a ton of items that I had wanted to donate for some time but had been holding onto for one reason or another. The number one tip I can give anyone when organizing or cleaning out a closet is to take everything out first. 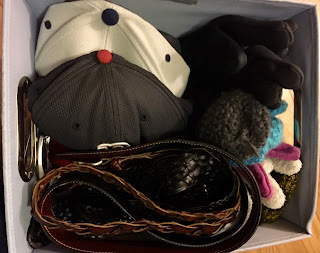 When you take all the items out you can see what you have clearly and put everything back in a more organized fashion. 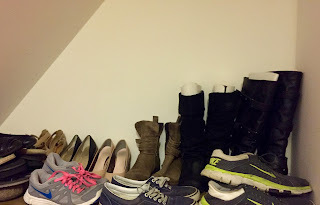 I ended up giving up three pairs. 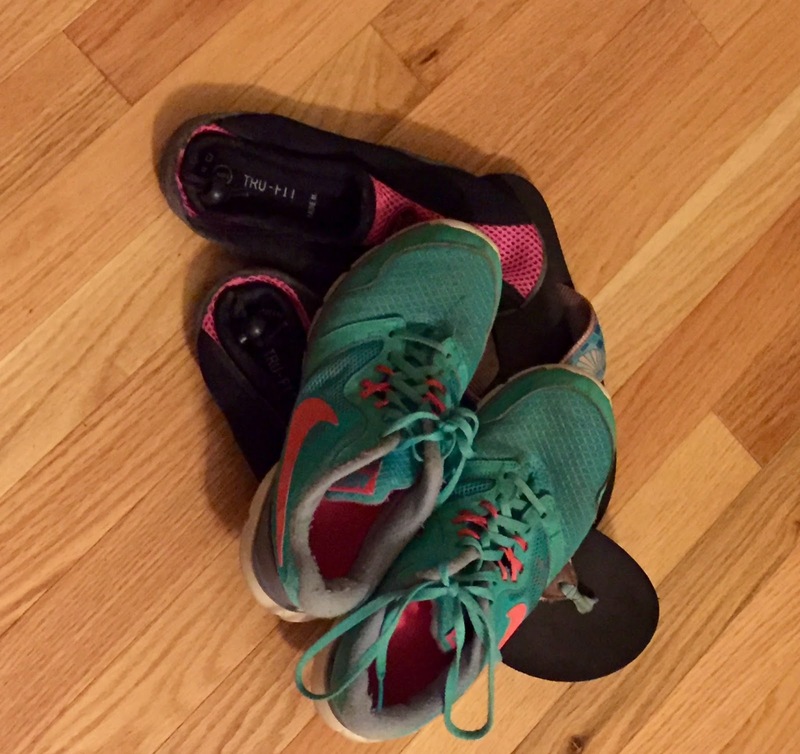 A pair of sneakers that I've completely worn out; they are dirty, ripped and offer no support so out they go! I also tossed a dirty pair of flip-flops and a pair of water shoes. By tossed I mean donated- I did donate all of these items! 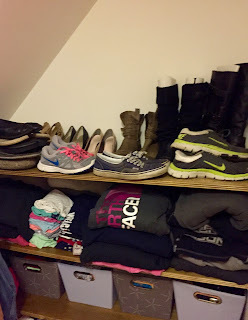 When I put everything back in the closet it seemed much nicer immediately! 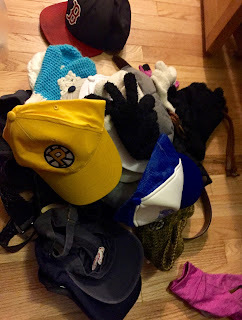 Next I emptied out a bin with hats, gloves and belts. 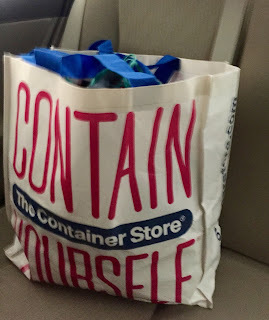 There were a ton of items in here that I wanted to toss. I'm not a big fan of wearing hats so I really didn't need a ton of free hats hanging around. I always accept free things but I really shouldn't if I'm not going to use it! Once I removed everything I wasn't planning on wearing, it all fit much nicer! After sorting through my scarves, bed t-shirts, and some other items the closet looked a lot nicer! I grabbed a few shirts and other items from my hanging items as well. Including bridesmaids dresses that I had destroyed and or won't wear again. 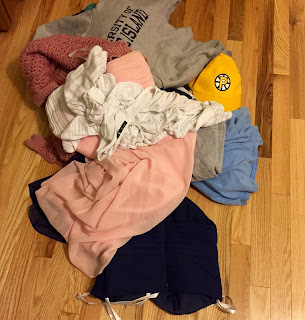 I donated a sweatshirt that has definitely gotten its use along with shirts that I had worn out. I honestly felt a million times better after filling up a bag with items I'll never wear again. 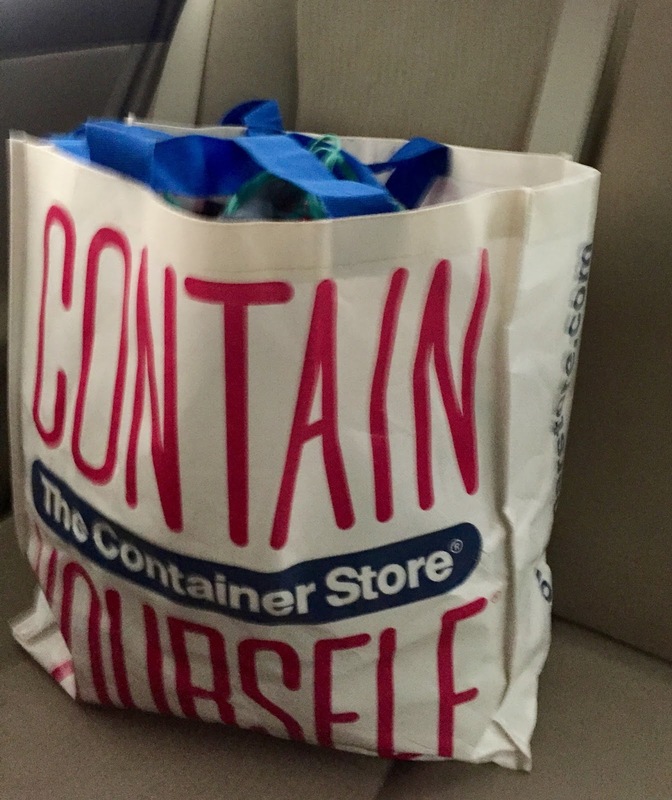 Above is my HUGE Container Store bag ready with donations. Honestly, why keep things you are never going to use? There is really no point to keeping items you have worn out or only wore once and have no plans to wear again. Keep your closet clean and you will feel so much lighter! On that note, I'm ready to find another area to declutter!